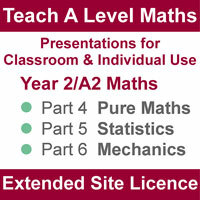 Extended Site Licence for Volume 2: parts 4, 5 and 6, continue from the 1st year to cover all the 2nd year A level work. Modelling is used in all 3 parts with some questions asking students to criticise the models. Two presentations deal specifically with proof but practice is given elsewhere when appropriate. (Permanent licence, not annual). There are 84 Powerpoint presentations containing in total more than 2000 slides. Theory, worked examples and summaries are included and also introductory exercises with solutions. Graphs and illustrations are used extensively to explain and enliven theory. Calculator use for Normal distribution calculations is explained. The materials have been written by experienced A level Maths teachers following good mathematical practice throughout with mathematical terminology gradually introduced. In the classroom, all you need is a Data Projector or Whiteboard and a computer running Office 2007 or later. Scroll down to add to cart. All required fields are marked with a star (*). Click the 'Add To Cart' or 'Add To Wish List' button at the bottom of this form to proceed.